The previous post showed a photo of crop residue remaining on the soil surface after sorghum and legume (green manure cover crop species) plants had been slashed with machetes at the end of the previous growing season. This is within a zai system where the planting micropits are dug on a 75 X 75 cm grid and sorghum and legumes planted in alternating rows of pits. Lablab biomass, with both preplant or split applications of 400 g cow manure in the zai pits, weighed 13-15 t/ha, even after sitting on the soil surface throughout the dry season. It should be noted that temperatures during the dry season in South Africa are much cooler (freezing temps not uncommon) than in other parts of Africa. In warmer areas, more of the biomass may have decomposed during the dry season. We had hoped to see higher biomass with a pigeon pea + cowpea combination. 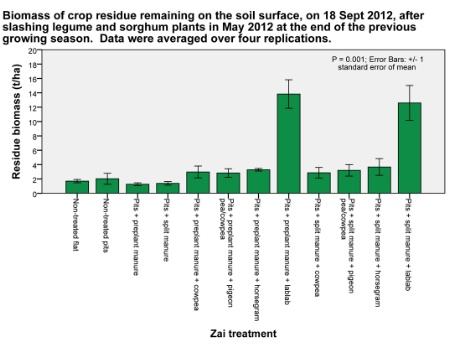 Pigeon pea, however, did not perform as well in this zai study as it did in an adjacent legume screening trial. In the zai study, the pigeon pea seeds were planted in the zai pits; in the legume screening trial they were sown on flat ground. Because of sandy soil washing into the zai pits, combined with the fact that pigeon pea seedlings are slower to germinate and establish than the other legumes, we ended up having to reseed the pigeon pea, causing delayed growth. Going into year two, the zai pits have already been dug and manured. We anticipate better performance of pigeon pea in year two, as we will be planting seeds into pits that have already had time to fill in a bit, lessening the depth of soil that the seedlings will have to push through after germination.